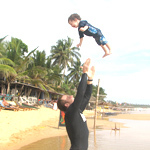 Many who visit Hikkaduwa are just sun worshippers, sea worshippers or wave worshippers. It is not the most cultural or historical of places, as I found out when asking about its history, for it resulted in much head scratching and glazed looks from local tour guides. However, with a long stretch of sand for soaking up the sun, a number of wrecks and coral reefs underwater for divers, and impressive waves for surfers to catch, who needs ruins to attract tourists? The foreign influx began here in the late sixties and before long the town began to bustle with fun-seeking visitors. New tourist-orientated establishments sprang up, such as Cool Spot, which is the oldest restaurant in town, having opened its doors in 1972. The Germans were the biggest influence for a long time, and although today many signboards and menus are still in German, the clientele is now much more international. In particular, the number of Australians is rising as the fame of Hikkaduwa as a surfer’s destination grows. For those interested in the sea, it is at its best for diving and snorkelling from November to March when the visibility is generally good. Hikkaduwa’s Coral Sanctuary, established in 1988, ensures the underwater world is accessible to all whether they can dive or not. Snorkelling in the shallow waters only 200m off shore is possible, and although the corals are dead in some places you can still come across a number of brightly-coloured fish as you float a few metres above. 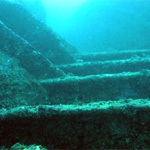 The less adventurous can always take a glass-bottomed boat ride, though this is environmentally questionable due to the pollution and negative effects on the already depleted corals. 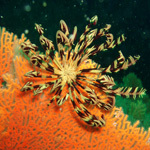 Should you want to see more of the Sri Lankan marine life than is in the sanctuary you will need to be a PADI qualified diver, or be willing to take your PADI course there and then. Although there are a number of dive stations, I would recommend Dive Sites Lanka because of their excellent new equipment, the efficient instructor Jayantha, and their responsible attitude to diving. With a number of sunken wrecks and reef gardens further out to sea, it is well worth discovering some of what underwater Sri Lanka has to offer. Finally, there are of course those attracted to Hikkaduwa by the surfing, which is thought to be second only to that at Arugam Bay on the east coast. I must admit that during my stay in Hikkaduwa every person I spoke to was there for the waves. In the morning I woke to see a number of foreign surfers bobbing around in the surf with their boards at the ready, and throughout the day I watched them go in and out, breaking for refreshment every now and then. Every November for the past five years the National Championship of the Japanese Pro Surfers’ Association has been held in Hikkaduwa and this year over 100 Japanese surfers participated. A word of warning for surfers though – not only are there some sharp corals near the best surfing areas but there is sometimes rubbish floating in the water, since local people tend to just dump their waste and wait for the tide to take it away. 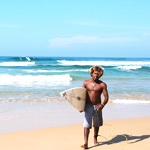 However, the waves are good and the atmosphere relaxed, so head down to Wewala with your board. Once you have washed the sand out of your hair it is time to do some shopping. Follow the Galle Road as it cuts through the town, while being very wary of the vehicles hurtling past, as they have little regard for the pedestrian on a shopping trip. Hikkaduwa comes into its own as the premier shopping destination for the backpacker. Clothes are tailored here to western tastes and in western sizes. Jewellery is not of the gaudy golden type, but the more understated silver type with beautiful semi-precious stones. There are dozens of souvenir shops with items from masks and puppets, to shells and corals, and from musical instruments to batiks and paintings. Do, however, be prepared to bargain – especially in the high season. Hikkaduwa by night means food, drink and dance. There is a wide choice of restaurants, offering excellent fresh seafood, lots of other travellers to meet and talk to, and menus that go far beyond rice and curry. If seafood is not your thing, then the excellent Restaurant Refresh has an amazing array of food and a stylish interior. Much less pricey is the wonderfully aromatic Rotty Restaurant. It is hard not to resist the freshly cooked “short eats” (snacks) if you feel like Sri Lankan tastes, or cheese, onion and tomato rotties for those missing western food. I dare you to leave without sampling the banana and chocolate rotties! The dance floor at Top Secret is actually not much of a secret at all and attracts most of the night-time action with people from all walks of life strutting their stuff on the beach to pumping music that includes Bob Marley classics in the time-honoured beach tradition. Leave your inhibitions at home and enjoy the friendly atmosphere and cold beers!